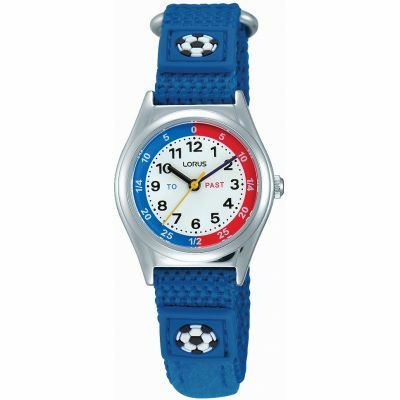 Lorus RG251KX9 is a functional Childrens watch. Case material is Stainless Steel, which stands for a high quality of the item while the dial colour is White. This watch is market as water resistant. It means it can withstand slight splashes and rain, but is NOT to be immersed in water. We ship it with an original box and a guarantee from the manufacturer. A watch for those learning to tell the time. I particularly liked the display of the minutes past and the minutes to the hour. Quite small which is good for small wrists but means the display is also small. Velcro strap can be a bit uncomfortable but ensures a close fit. Super fast delivery, watch as described, we havent given it to our daughter yet but I am certain she will love it- its purple with flowers on it!!! 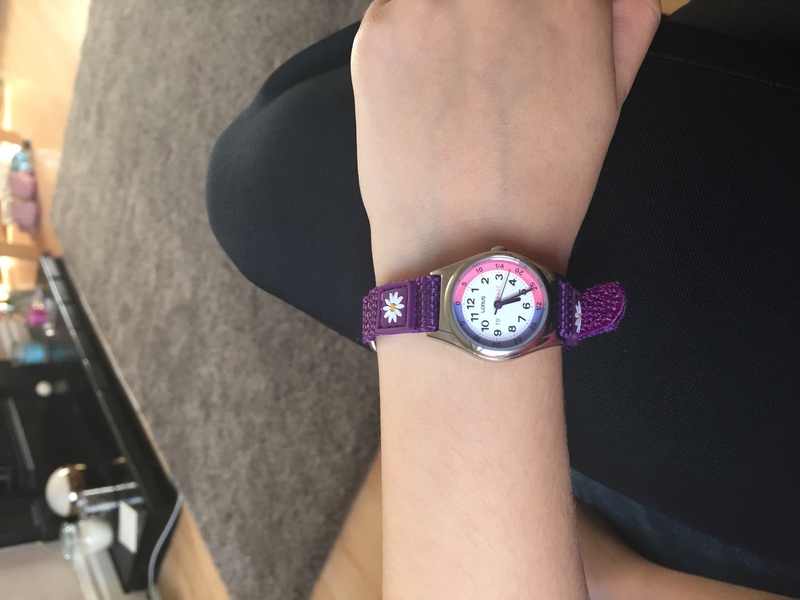 The watch was a gift for my 5 year old for her birthday, she was so pleased with it. It looks really nice on and with the Velcro strap fits perfectly. She is learning to tell the time really quickly with it, its face is very clear and concise. Brilliant product, fully adjustable strap for little wrists. This was bought for my daughter and already understanding the concept. 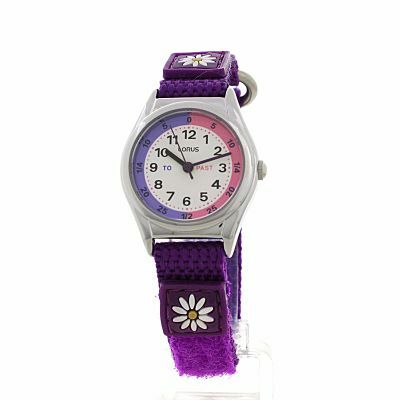 A lovely pretty little watch suitable for young girls. The only issue with it is that the face is really quite small which isnt obvious in the photographs. What a superb watch for little learners makes learning to tell the time so easy with the to and past on the face. The strap is good too as it will adjust to fit any child. Excellent watch. Lovely watch, perfect for my little girl to learn to tell the time. This watch is a Christmas present for my daughter so it hasnt been worn yet. The watch arrived on time and the box was well sealed.The packaging around the watch itself is a little flimsy but the watch looks to be in good working order. I thought the watch was really lovely. Great colours. For my granddaughter for Christmas. It was smaller than I expected but perfect for my daughters wrist. 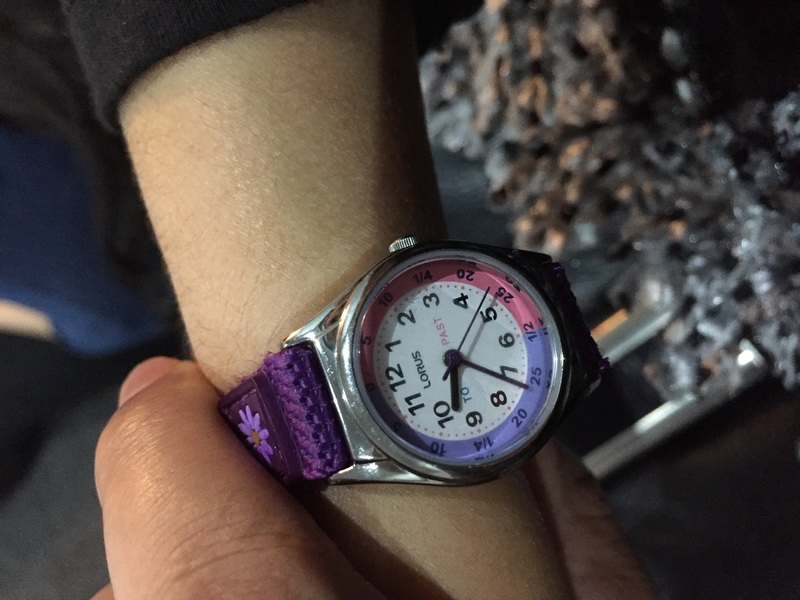 Dial is clear and the strap is robust whilst still being pretty enough to appeal to a five year old! It was well packaged and Im so far very happy with it. Lovely little watch, got he pink one too for my twin girls. just what I wanted for my young granddaughter. Nice size, clear face and sensible strap. A lovely watch for my granddaughter which helps her tell the time. Great purchase, really pleased. My granddaughter was chuffed with her new watch as she is now able to learn to tell the time. This was for a birthday gift for our 6 year old daughter who is learning how to tell the time. The watch is a perfect size for her little arm. The layout of the watch face for past and to are great for her and within hours his was able to tell the time with this little proper watch. Watch is just what I wanted. Service was excellent and watch received very quickly, packed well and all documents supplied with it. Would use your company again and happy to refer to friends. Watch is exactly as pictured, Ideal for my daughter, hopefully she will be learning how to tell the time in no time at all! Excuse the punt. Bought this watch for my daughters 7th birthday, shes very eager to learn how to tell the time. I thought the packaging was great, she loved it, she wore it all day and was able to take it off and put back on unaided as it has a Velcro strap. She now understands a little better of which is past and to the hour and was telling us the time throughout the day. It looks pretty and I think its a brilliant way for kids to learn the time. A really pretty watch and excellent value for money. My granddaughter can put it on herself, which makes her feel grown up! I bought this watch for my 10years old daughter. It was a bit slimmer than I thought but as shes got tiny wrist that it looks really good on her. Its very easy to put on unlike the holes on a band and easy to read. Shes been telling me a time every 5 minuites! I did respond to your questionnaire. It is a gift, so not used yet, but it looks fine. Great service, watch is just what I wanted for a first watch. Packaged really well. Quick delivery. Would definetely use again. Lovely first watch for my granddaughter. Watch looks good and I am sure my granddaughter will like it for her birthday. The watch is for my grandaughters birthday, so cannot yet make a comment. Excellent service, excellent watch! An extremely happy 8 year old who can tell the time after 2 days of wearing it!! Perfect, thank you!! Excellent price, free postage and super quick delivery. What else can be said? The best deal on the market! Extremely pleased with the service. Just a quick phone call and had my watch the following day. The staff were very helpful and easy to talk to. Thanks again for a pleasant device. Brilliant. Excellent watch for children learning to tell the time, none of this 24 hour rubbish, watch exactly as the picture on the web site. Beautiful watch, perfect for my 4 year old. Colours are just as the photograph. Introduced in 1982, and part of the world-famous Seiko Watch Corporation, Lorus watches are globally known for durability and reliability. The collection includes affordable and attractive options for men, women and children in a variety of styles. Both digital and analogue watches are available, as well as easy-read watches to help children learn to keep the time. A number of sporting chronograph watches are available, with sleek metallic bracelets and masculine face designs. Many feature both analogue and digital timekeeping on one face, offering excellent precision when every second counts. Delicate ladies watches are offered in shining silver and soft gold, adding a touch of glamour to any outfit. Meanwhile, casual everyday pieces are also available, at a price you're sure to love as much as the watch. Explore the full Lorus collection here, or browse the full range of Seiko watches. Watch Shop is an authorised Lorus stockist. Sign up to receive email updates when new styles of Lorus are added to Watch Shop!